View attachment 841912 Tough to pair grey jacket. Does it work ok with charcoal here? I am afraid I don't really like the combination. I'm wondering whether to try with dark brown or olive green (even navy) trousers perhaps. It's somehow a relatively 'warm' grey, which is more noticeable when put against other grey shades. Hard to pair (although a very comfortable jacket with a lovely handle). Just some few pics in a hurry after the mandatory rounds in the runningwheel. Been a while since I have visited this forum. Thought I'd post a super high resolution pic from pre-labor day...give you gentleman and idea of what my wardrobe has been up to. 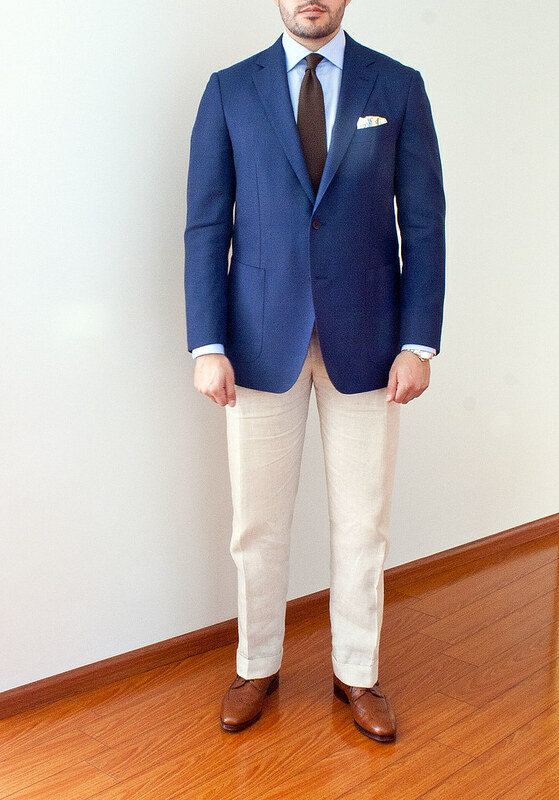 New suit arrived earlier this summer - W. Bill Cream Irish Linen 3r2 with patch pockets and barchetta and MOP buttons. Also featuring some Vanda accessories and suede tasseks. Very nice @PCK1 I certainly couldn't wear such a light colored suit - I would spend the better part of the day worrying about stains, which would leave me being overly conscious of my surroundings all the time! So assuming you want to combine with a darker and not a lighter color, I think all colors you suggest might work. Green I find is a most versatile color, certainly a 'softer' green such as olive green. So I am with you here: a darker olive green would be a nice experiment. Darker brown? Unless they are part of a suit I am struggling with brown trousers all the time. 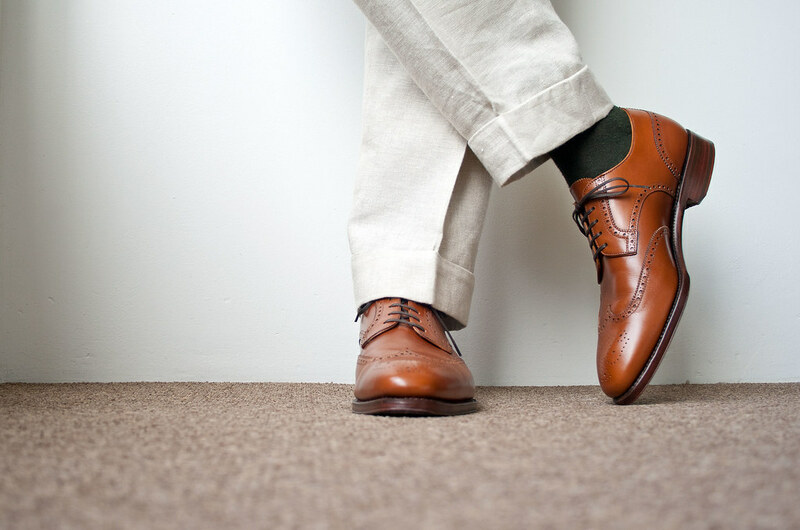 Somehow brown trousers distract me, invariably drawing my attention to the legs. And that should not be so, because to my mind all pieces of clothing one is wearing should form a whole, a symphony, not standing in the way of the human being wearing them, the conversation going on, nor the occasion at and for which they are worn. (Only the accessories can be a bit of a dissonant, folly or distraction. 'Can', not should). May be a very dark chocolate could work, though. Or a darker tobacco. Come to think of it however, a kobicha brown perhaps can work very well too. I have seen people wearing it and liked it. But that was with a pale blue blazer. 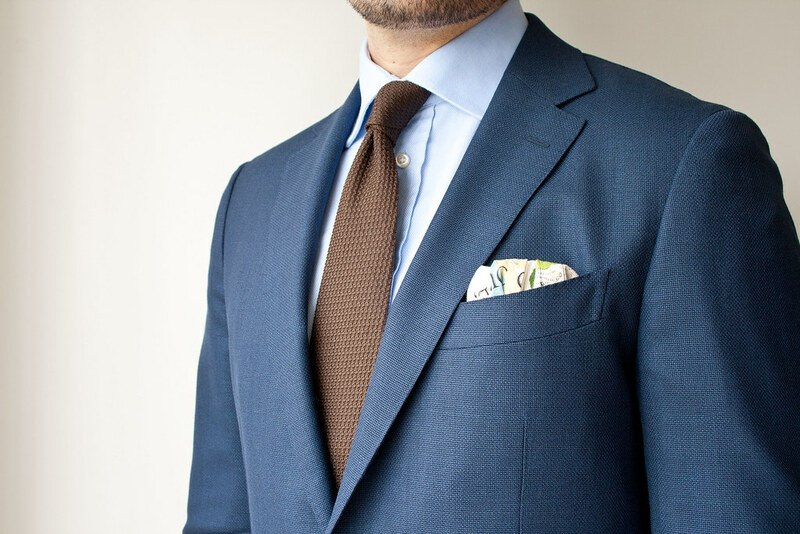 Navy blue too is a versatile color. But it is not a terribly warm color, I think. It could work, if you want to create an interesting contrast between warm and not that warm. But if it truly will work depends on the kind of navy blue you will choose. Perhaps especially the deeper, richer navy blues, like Space Cadet might turn out well. In the end it is all a matter of finding the right contrast, I assume. In that respect the fabric will be very important too. Especially texture. If only because it will have quite some impact on how the chosen color will perform. From today. This jacket needs to be taken in just a little bit. Consider it's a 56 and the trousers are 33. Standing in front of the totally non-functional "gates" to Bel Air on the corner of Bellagio Road and Moraga Drive and once again showing how almost everything around here is just an illusion. 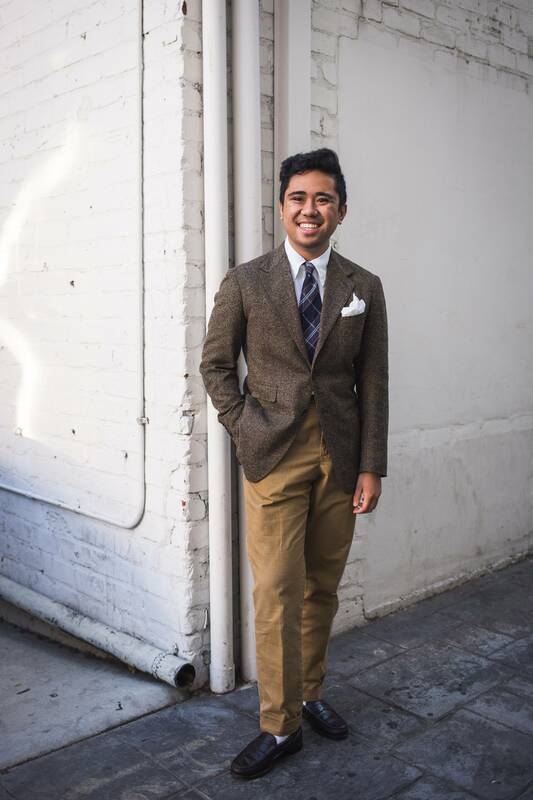 Brooks Brothers tweed jacket, generic pocket square, Polo Ralph Lauren tie, Faconnable tattersall OCBD shirt, Vineyard Vines belt, L L Bean cord trousers, and Allen-Edmonds shoes. A Piece-Of-A-Person (with ginger scone) picture. A non elegant life in nice clothing.